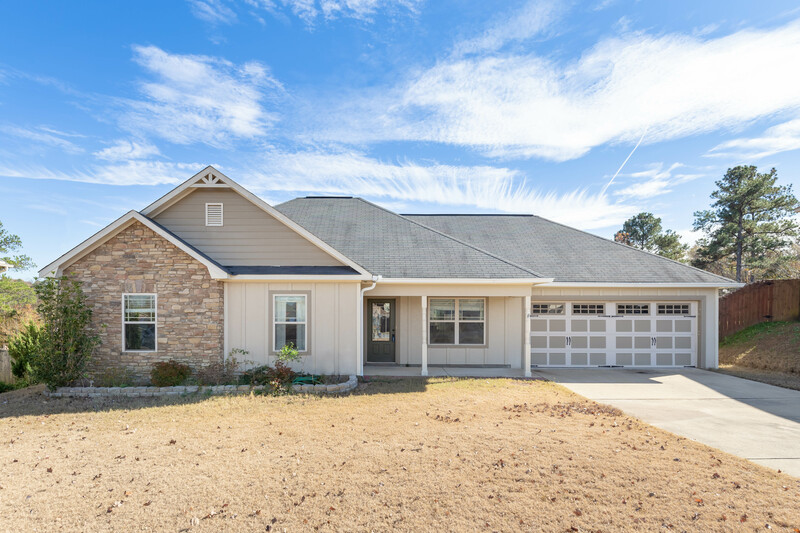 Check out this fantastic craftsman home in Willow Ridge! This quaint neighborhood is a hidden gem in Lee County - tucked back off Auburn Rd - you will enjoy the privacy of this cul-du-sac community! An easy commute to JR Allen for quick access to all your favorite places. Truly move in ready this home features fresh paint, new flooring & an open floor plan - this is an easy choice! The backyard offers private wooded views from the custom built deck - perfect for entertaining family & friends! The living room is spacious w/ vaulted ceilings for a grand feel, a stone fireplace & opens to the dining area/kitchen. Great cabinet storage, lots of counter space & a bar overlooks the main living area. The master includes a private ensuite w/ separate shower, deep soak tub & dbl vanity! Additional 2 bedrooms are large w/ a full bathroom in the hallway. This home is in TERRIFIC condition!